A romantic vacation scene with small wooden fishing boats during a colorful sunset in Cadiz, Spain. A typical scene along the coast of Spain, quaint wooden fishing boats anchored along the beach in the City of Cadiz at sunset. The sunsets in Cadiz are stunning, as the sun sinks to the horizon and sheds an orange glow over the Atlantic waters and beach. Small fishing boats anchored at Playa de la Caleta at sunset in the City of Cadiz, Province of Cadiz, Costa de la Luz, Andalusia (Andalucia), Spain, Europe. 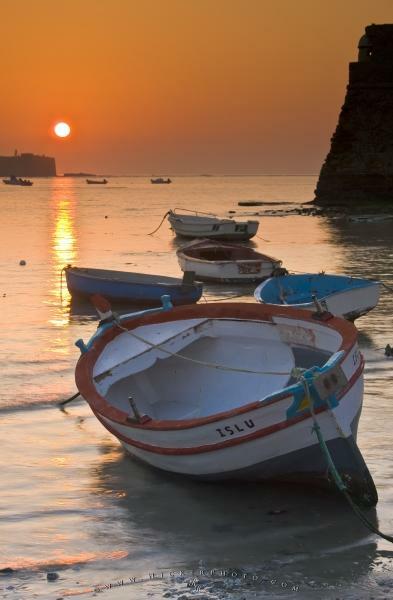 Photo of wooden fishing boats during sunset in the city of Cadiz, Spain. Pictures from photo gallery "Boat Pictures"
This picture is part of the photo album "Boat Pictures" - there are more beautiful images waiting for you.